As with many non-profit organizations, the need for volunteers is great. If you have been looking for a way to get involved with helping young people, here is a great opportunity. Located right here in our very own U-district, you’re just a step away from making a difference. ROOTS was the first overnight shelter in the city specifically designed to meet the needs of homeless young adults, and is one of the only co-ed shelters in the city, providing an integral piece of the continuum of care for homeless persons in King County. Become a Dinner and Shelter Prep for ROOTS! Having a place to receive a nutritious meal and shelter for the night can make all the difference in the lives of our guests at ROOTS! Volunteer crews help prepare healthy meals, as well as set up shelter (typically helping to get clean bedding ready for use in the shelter) for our guests! When guests are able to eat nutritious food and get a good night’s rest, their bodies and health is maintained – which on the streets can mean the difference between life or death. Come make a difference in someone’s life! Note: please be punctual to this project, but not early. At times, staff is not ready for volunteers – even if you are 10 minutes early. The Washington Department of Transportation reports that construction crews will close all eastbound lanes of the floating bridge and highway from midnight to 5 a.m. Sunday, April 27, between Montlake Boulevard and 108th Avenue Northeast. During the closure, crews will pave and restripe lanes to create a safe area for continuing their work on the Eastside Transit and HOV Project. A single lane of eastbound SR 520 between 92nd Avenue Northeast and Bellevue Way will remain closed until 11 a.m.
Drive Safely and Get to your Destination Happy! If you have exited north I-5 at 65th recently, chances are you may have noticed the goats! Rent-a-Ruminant, owned by Tammy Dunakin, brings goats into the city to help clear away vegetation by eating it! These goats will eat balckberries, ivy, and other invasive species. Ruminants are mammals that are able to acquire nutrients from plant-based food by fermenting it in a specialized stomach prior to digestion, principally through bacterial actions…The word “ruminant” comes from the Latin ruminare, which means “to chew over again”. Dunakin and her herd come from Vashon Island and with the help of Pearl the herding dog, they can clear an otherwise hard to clear area pretty efficiently. It’s a pretty sweet life. Dunakin camps nearby in her trailer with Pearl and jokes that she is an “urban nomad.” At the end of the day, these goats are doing some great work and loving it. On the Rent-a-Ruminant website it’s stated that the goats are not slaughtered when they are unable to work they are re-homed and retired to chomp to their hearts content with a loving family. For quite a few years, the Seattle Department of Transportation has been renting the goats from Dunakin to clear the toughest areas deemed too dangerous or inaccessible for humans to work in. It’s a win win all around! It is quite the treat to stop by and watch these 'kids' working. They are quite friendly too, and will come over to the fence to say hi. Dunakin's herd has got some real personality. This guy was showing off his stuff. "Hey kid, get back to work!" Last May, during a elementary school ultimate frisbee practice at Cowen Park, the game was halted due to a mysterious furry white creature hopping through the bushes. When I picked up my daughter from practice she told me what happened and then asked if I thought it was a wild bunny. I said, “no, it was probably abandoned.” Then she said, “mama, we have to go save it!’ We turned around, went back to the park and found the derelict bunny and brought him home. Just so you know, bunnies are very cute, but unless they are raised correctly, they can be very hard to handle and not very cuddly. The bunny we brought home fit into the latter category and try as we might, and many scratches and bites later, we realized he would do better in a home with someone who had a lot of bunny experience and could rehabilitate him. Nilly, as we called him, was a beautiful white rabbit, the quintessential white rabbit from Alice and Wonderland. When you see bunnies, they really are irresistibly sweet and furry, but they are a pet that requires very specific care to ensure a healthy and happy rabbit. Unfortunately, many parents, boyfriends, partners and such think that a bunny would be a super cute gift, but it often ends with either a very sick rabbit, or in the case of Nilly, one that is abandoned to become raccoon food at the park. According to Rabbit Haven, a non-profit that cares for unwanted bunnies and educates the public about rabbit care, every year “thousands of tiny baby rabbits are purchased for Easter gifts.” From their website, they have a list of reasons why this should be avoided. Rabbits are not toys to be set up in a kid’s room only to come out when the child FEELS like playing. The rabbit needs a family to live with who loves them. They need room to play and be themselves. Rabbits are not always cuddly and do not always like to be hauled around. They are affectionate, enjoy running and playing on the ground and use litter boxes. Rabbits can become frightened when held or confronted by prey animals, like the family dog or cat. THEY NEED LOVING, GENTLE CARE. Rabbits need to live indoors to be safe from diseases and predators. Rabbits are not low maintenance pets. They require as much work as a cat or dog. Rabbits have high social needs and often want another rabbit as a companion. Rabbits are not good first pets for a very young child. Kids lose interest quickly, and rabbits need continual love and support for a lifetime. Rabbits can live 10 years, sometimes longer. Rabbits need medical care from an Exotics vet. Spay or neuter can cost $150 or more, and rabbits require routine veterinary care. Rabbits have special diets and housing needs. Rabbits cannot be set “free” out of doors- it’s a death sentence. They are usually killed by predators within 72 hours, suffering terribly. MOST RABBITS PURCHASED AS EASTER GIFTS END UP ABANDONDED ON THE STREETS OR AT SHELTERS. If you or someone you know is considering getting a bunny, please pass this information on. As with any pet, one should always inform themselves on the pro’s and con’s of what they are getting. All species and breeds of pets have unique needs and dispositions. Make sure you are informed before you bring any pet into your home. Why Are Students Falling Out of Windows? There seems to be an epidemic of young people, especially university students, falling out of windows as of late. Unfortunately, drugs and/or alcohol seem to be involved in many of the cases. April 8, 2014, a University of Washington student is found critically injured outside a Fraternity house after apparently falling three stories out a window. March 23, 2014 a student at a UNC in Charlotte fell out of a dorm window to his death. January 21, 2014, a 19-year-old Penn State student suffered injuries after falling from a second-floor balcony. September 2013, a 19-year-old University of Minnesota student dies after falling from a 6th floor window. In this most recent case of the the critically injured UW student, there was alcohol reported on the scene, but the Seattle Times reported that UW Police Chief John N. Vinson said “we don’t know what happened yet, and I hesitate to speculate.” The student was taken to Harborview Medical Center and has been reported to be in serious condition. The question that needs to be addressed is how to get the word out to this vulnerable population of young people to pay attention to safety hazards when they are out partying, or hanging out with friends. It’s entirely possible that some of these kids are living on their own for the first time and are just not making informed choices as to placement of furniture and beds in proximity to windows. Another problem is the overcrowding on balconies during parties or gatherings. That’s how the Penn State student fell; after navigating his way through a crowd, he was apparently stepping on chairs and other furniture and he stumbled over the balcony. If you notice someone is intoxicated and in dangerous proximity to a window, take measures to protect them by guiding them away, or close the window. How American Glory, Cheese, Elvis, Spatulas & Cows all Have Something in Common? Jet City Improv takes on screenwriter Aaron Sorkin’s style of drama with their newest offering of American Glory: The Lives of the Staffers at an American Institution Sorkin hasn’t Covered Yet. If you don’t know already, Sorkin is the creator of TV shows including West Wing and Studio 60, and movies such as A Few Good Men, Moneyball and more. He writes intelligent scripts and is known for creating snappy dialogue and engaging characters. Using this style, Jet City is able to bring a little humor and a lot of truth to the world of American landmark institutions. But, what is an improvised play? If you ask most people they wouldn’t really know. A lot of people associate improv with popular shows such as Who’s Line is it Anyway, hosted by Drew Carey, or mistake it altogether for pre-written comedy skits such as seen on Saturday Night Live. I thought I would sit down with Jon Axell, cast member and marketing director for Jet City Improv to get a little more detail about what improv is, and why you should go see it. Improvisation, in theatre: the playing of dramatic scenes without written dialogue and with minimal or no predetermined dramatic activity. There are different styles of improv theater that include short-form (who’s line is it anyways, and improv games) and long-form, where a core theme is played out in multiple improvised scenes. Axell is quick to point out that in all improv, it begins with a collaboration with the audience. It is from them that the subject matter is determined. Improv is not supposed to try to be funny, but life and truth are really funny when combined with seasoned improv performers. Axell says that, no suggestion is wrong or right because that is the improver’s job, to take the suggestion’s and turn them into a story. He says that the audience shouldn’t feel that they need to be funny or clever when calling out a suggestion, that some of the best suggestions are just ordinary ones and ones that come from the heart or have some sort of emotional value. He recalled one of his favorite suggestions when a cast member asked the audience for a non geographical location. An audience member suggested ‘the zone.’ He said it was perfect! ” I mean, ‘the zone’ is totally a place” and he said the cast members were able to totally go there. Axell and other cast members have a running tally of the most common suggestions. The winners are Cheese, Elvis, cows and for some reason spatulas. So what do they have in common, you may still be wondering…? Well, that’s you! The audience. It’s the collaboration between the cast and the audience that makes improv really worth the effort to go check it out. Here is how it went down opening night for American Glory, and remember, there’s no spoiler alert needed, because each night you go will be a completely new experience! The lights came on and cast member Mandy Price came out and requested from the audience things that were American Institutions. People shouted out things like Apple Pie, Baseball, Prom and other American standards. The cast went with Prom, and so began a fantastic drama starring the staff of the Senior Prom Association Board. Elicia Wickstead became the esteemed President of the association and we met characters on her staff such as the Director of Picture Posing, the Director of Student Relations, Assistant to the President and even an Oversight Lawyer from President Obama’s office to Oversee the recent flood of expulsions from national high schools. Why were they getting expelled…? Well, because of ‘freak’ dancing of course! We got to witness intense drama including the calling of meetings with the Limousine Drivers Guild and requests to withdrawing funding from Smirnoff because it might be inappropriate and so much more! The Jet City Cast was able to weave a hilarious yet totally solid and mesmerizing story of drama, love and liberation and ended it with an authentic feeling of American Glory. …a special election was held where voting booths were set up for ladies throughout Washington. It was to decide the state flower that could be an entry for the 1893 World’s Fair in Chicago. Clover took a close second, but the ‘Rhodie’ won in the end. 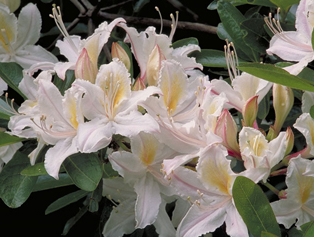 This Sunday, April 6, from 1-2:30pm the Washington Park Arboretum is offering a FREE tour that will feature some of the over 1800 Rhododendron species and cultivars in the UW Botanic Garden collection.